Photo Caption:Woodforest National Bank branch managers joined Kim Marling, Executive Director of Woodforest Charitable Foundation; Dixie Sucher, Vice President of F.A.C.E. and Kelly Chambers, President of F.A.C.E. 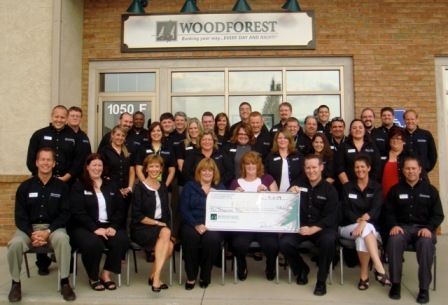 CINCINNATI, Ohio – Woodforest Charitable Foundation contributes $10,000 to F.A.C.E. (For Aids Children Everywhere). As the number of infected children grows, so will their needs. Woodforest Charitable Foundation’s recent donation to F.A.C.E. will help support their program that assists and educates families and children with HIV/AIDS. Over the past years, For Aids Children Everywhere has known many children with HIV/AIDS, each special and unique. F.A.C.E. honors them: both those who have passed on and those whose struggle for survival continues. These remarkable children, who have struggled with life and death, were able to find beauty in their painfully short, yet spirited, lives. In their memory, F.A.C.E. commits itself to the battle against AIDS and HIV disease. For more information about F.A.C.E., please call (513) 584-3571, send an e-mail to faceoffice1@aol.com, or visit www.facecincinnati.org.